De.mem group has group companies in Australia, Singapore and Vietnam. De.mem Limited was established in October 2016 in Perth, Australia. The company listed on the Australian Stock Exchange (ASX) in April 2017. De.mem Limited owns 100% in De.mem Pte Ltd, Singapore. De.mem Pte Ltd was set up in April 2013. The company’s commercial operations started from the year 2014. It operates two manufacturing sites in Singapore. De.mem Pte Ltd has a number of subsidiaries in Vietnam. De.mem Viet Nam Co Ltd is the operating subsidiary of the group for Vietnam and licensed to do business in this country. 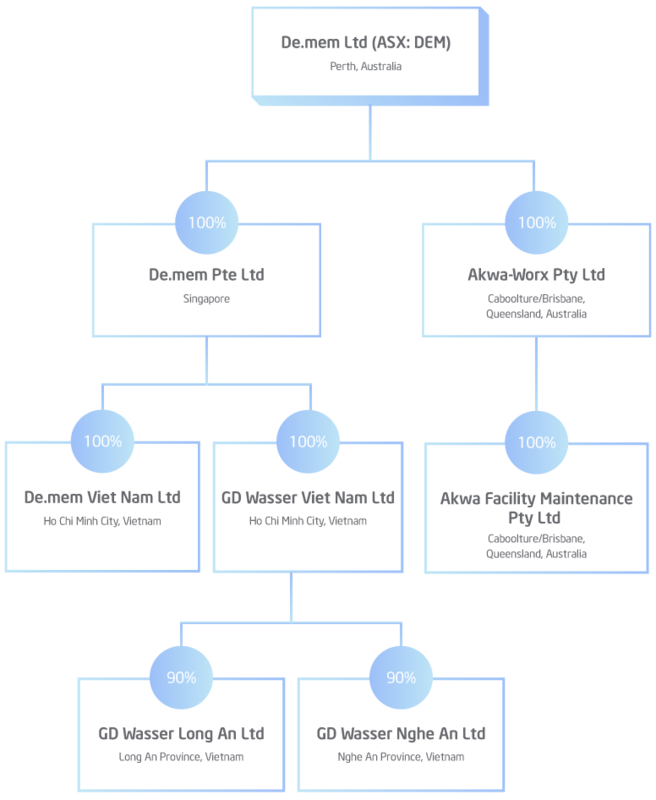 The GD Wasser group structure serves as a holding structure for assets related to water treatment in Vietnam. Through GD Wasser Nghe An, the group used to own a water treatment plant which provides water to industrial clients and a municipality near the city of Vinh, Vietnam. This water treatment plant was sold in August 2017. The two group companies based in Queensland, Akwa-Worx Pty Ltd and Akwa Facility Maintenance Pty Ltd, were acquired by De.mem in September 2017 and serve as De.mem’s platform for expansion into Australia.